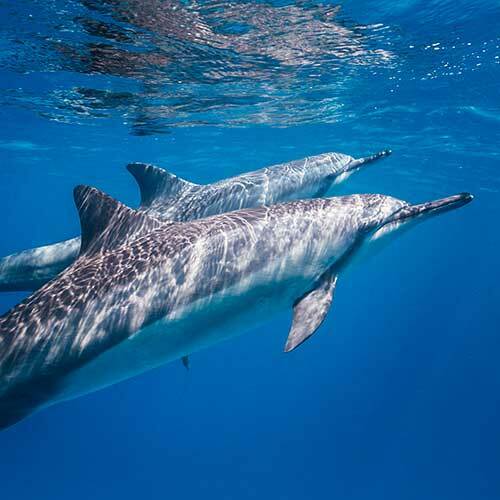 Swim with a variety of dolphins along the Kona coast. See these incredibly intelligent creatures in their natural habitat. Experience the joy that comes from being close to another highly intelligent mammal - just as curious and inquisitive as you are. Join us in the morning as we search for Hawaiian Spinner Dolphins and several other interesting species. Occasionally we’ll find larger, rare marine life offshore, and during whale season we often see Humpback whales. This charter requires confident swimming skills, and launches early in the morning. The dolphins are very active animals, and often we have to swim 50-200 feet away from the boat in water that is 50+ feet deep. We launch early because the dolphins are nocturnal animals, and there is limited opportunity in the morning to interact with them before they begin resting. After we've had our dolphin encounter, we'll head to a secluded reef that's only accessable by boat. 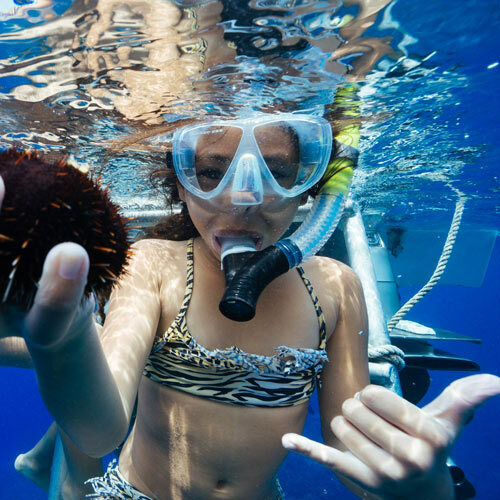 You can snorkel or practice freediving, and swim with tons of tropical fish. Mask, snorkel, fins, snacks, drinks, and towels.